Baby Casper was rescued with his sister Wendy. Both orphan kittens came in with a severe upper respiratory infection. Wendy spent a number of days in intensive care at the emergency vet hospital but the virus was too much for her and she passed away yesterday morning. Casper is currently in intensive care with pneumonia at the vet hospital as he needs supportive care and oxygen. The veterinarians are optimistic that he will make it. Donations for Casper's care would be greatly appreciated. 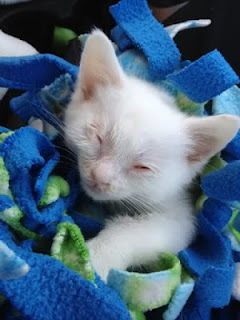 Please contact Cathy at 651-230-3263 if you can help in any way, or if you prefer to donate online, click on the donate now banner on the right of this blog or the link on the Donate page and specify your donation should go to Casper. Please send good thoughts his way for a full recovery. We hope to have a positive update very soon.